Exacting emulation of this legendary, even infamous, VCA compressor. 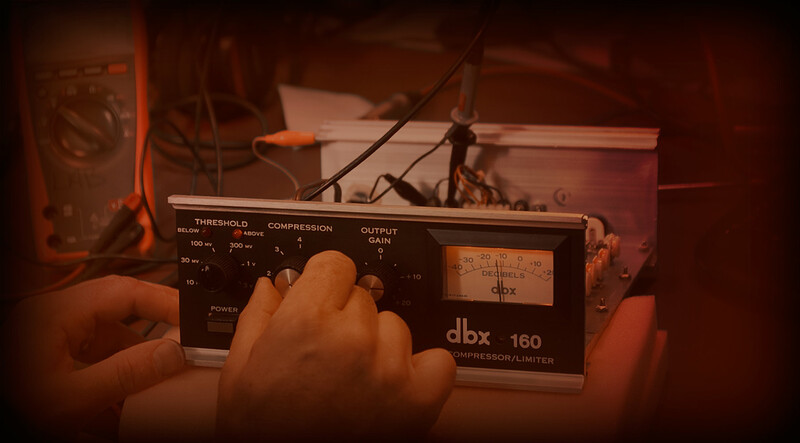 The dbx 160 Compressor/Limiter for UAD-2 hardware and Apollo interfaces is a fully licensed and faithful emulation of the legendary dbx 160 hardware compressor/limiter — still widely considered one of the best “character” compressor ever made. Famous for its simple control set and firm, often radical compression characteristics, the solid-state dbx 160 plug-in features nonlinearities not found in other VCA compressors, giving it a sonic personality all its own. If you’re looking for a transparent, neutral compressor, this dbx 160 is not for you. Whether you’re using it on synths, bass guitar, or a drum bus, the dbx 160 plug-in emulates the original hardware’s grabby, low-end glue. With old-school character for days, the plug-in version features all of the same unique nonlinearities that make it a must-have for any engineers compressor toolkit. With the same simple control set and at-a-glance metering of the original, the dbx 160 plug-in makes it easy to crush a parallel drum bus, or inject subtle fatness. It can also add aggressiveness and impact to everything from guitar power chords to a hip-hop vocal. In this video, learn how to add parallel compression to drums, even out a bass performance, and bring presence to acoustic guitars with the dbx 160 Compressor/Limiter. DBX 160 The only Drum Compression ever needed! Wish I could give it a 6! Out of all the DBX 160 plugin's this one is by far the best of all companies. Very warm, and with that extra kick in the shorts. This thing lights up my drums every time! This sounds about 97% of the hardware version! This by no doubt the closest to the real thing as far as i heard any other plugins. However the big minus with a lot of UAD plugins is they are not scalable and especially the dbx160 plugin is a tiny little thing on a 30 screen of Apple for. I hope that more users are mentioning this point to make the company to move ahead within issue. Very annoying. So 5 stars for sound . and 1 for this poor gui. I've had experience with the hardware going back to its introduction in the 70s. It's part of a sound that is at the core of my preferred production genre. To me, this plug is about as close to having the hardware as I can imagine. For old funk and soul productions, it's perfect. Great on bass, keys and drums: it just WORKS! Bonjour, c'est vraiment un super compresseur je l'utilise sur des basses synthétiques car pas de basse dans le home studio et ça sonne comme une vraie. C'est vraiment incroyable! Ca lui rajoute un grain et une présence comme si on venait taper dans les vrais micros d'une basse. Très bon plug! This is a specialty unit for sure. If you want a swiss army knife stick with 76's and the like. This thing is not subtle. VCAs like the dbx160 are easily the most grabby of the different compressor & limiter designs. I use this a lot on bass, kick, snare, and parallel compression busses. This compressor does "thwack" better and more easily than any other I have used. To fatten up a rock track and glue the low end together, send your kick and bass to an aux and slap a 160 on top. Crush the signal and then pull it way down in the mix. It will give you a subtle glue on the low end and a little more impact on the kick drum. With dbx160 plugin, I can "insert" any bass drum to any mix! With only two knobs I can get any type of attack and punch. Very useful and time-saver plugin! After living with it, alongside my only surviving hardware version of it, I pulled my old friend from the rack it lived in and retired it, The plug in version sounds and behaves just like it. Without listening, replicated all the knob positions in the plug in, and started switching from one to the other. it was 99% the same, the hardware 160 was a little louder (about 2 dbs) once the levels were matched I demoed them to a client whom I know has good ears, he could not tell them apart, then I had him switch channels for me, I could not tell them apart. Enough said. I've only used it on vocals and its GREAT on transients.. It just works man...Put a Fairchild on top of it and see what happens.. Well, I love what happens. after years of regret for having sold my hardware version of this old box, i was excited to hear that it was being modeled by UAD... i use this thing all the time on bass and drums. takes me back every time i instantiate it! thanks, UAD, for being so faithful to the sound of the original! This is the best software compressor of its type ever created ! The punch of this one is fantastic ! With this tool no more lack of punch ! Essential tool in our arsenal ! Universal Audio are the kings of processors for real punch ! i used to work my ears around two original dbx 160's and this plug surely brings back those memories. sounds so good! I was fully ready to be disappointed. Wow. It sounds just like I remember it. This is the first time I've heard a plug-in sound this smooth and transparent (especially on vocals) ever. I'd been meaning to buy the actual analog unit - but not really a need now. I'll be using it all the time. Probably the most underated software compressor in the UAD range or native even. The most versital capable of the most extremes as well. I can't say enough good things about it. I have try the hardware and i say that plug have the same sound. I often use the brauerizeâ„¢ technique and the dbx are perfect for my VCA-Bus. I can only say buy buy buy buy. I'm Happy with this great comp you can use it for drums or Vocal just a little problem some times with attack (Click) but you can fix it with Spl Transient design . After demoing this on a bunch of loops, it felt like the best solution to really pump up drum loops for use in EDM production. ???????? ?????? ???? ?, ???????????? ????? - ???????????? ?, ??? ????????? ???? ? ??????? ?, ???????? ?????? ?????????????. ????? ?, ????? ??????? ???? ?, ???????????? ??? ??????? ?????????? (? ??????? ?? ????????? 1176LN), ? ??????????? ????. ??????? ????????? ??? ???? ? ???????. ?????????????? ????? - ?????? ???????? ?????????? ? ????? ??????? ?.